♦ Guaranteed 48 hour dispatch of your order. ♦ Free bonus bling gifts on offer for all orders over $80. ♦ Organza bags & greeting cards available for gift shoppers. 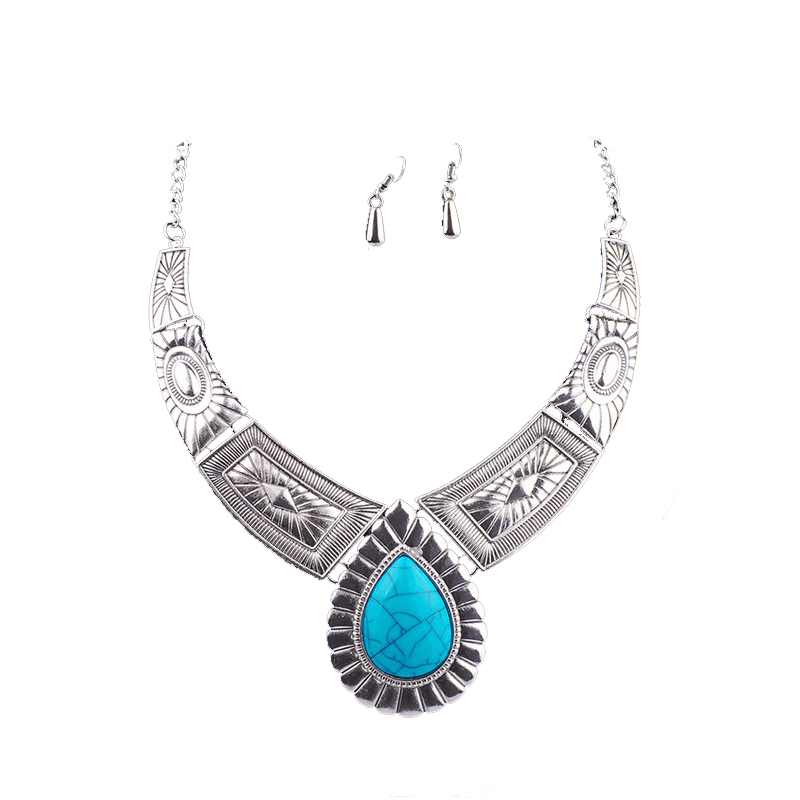 Greta Turquoise Necklace Set - Buy this fabulously stylish piece of fashion jewellery online today and give your fashion accessories collection a boost of beautifull bling! Be prepared for any occasion when you stock up on our fabulous array of costume jewellery online Australia. Don't forget your Free Bonus Bling Gift when you spend over $80 with us today. Happy shopping! We use Australia Post for national shipping. Our shipping fee is a flat rate of $11 for Express Post service. All orders are dispatched for shipping within 48 hours of payment confirmation. Australia Post states next business day delivery within the Express Post delivery network and fastest possible delivery for all other areas. Please allow 10-21 days for delivery of any item within our exclusive new Glamazon and Cubic Zirconia Collections. We use Australia Post for international shipping. All orders are shipped within 48 hours of payment confirmation. Our shipping fee is a flat rate of AUD$25 for Standard Air Postal service. Delivery is estimated to be between 5 and 7 days depending on your location. International orders may incur taxes and custom duty costs. As the recipient you are liable for all import costs and local tax charges so please be aware of your local laws regarding these matters. Use Paypal a simple and secure online payment system. We want all our customers to be happy with their purchase and as such we offer a three day hassle free exchange policy on all our products. You may return any item for an exchange provided that it is returned in its original packaging and in a resalable condition. This offer does not apply to clearance and sale items. Please note that we do not cover the exchange shipping costs. For health and hygiene regulation reasons this policy does not extend to our range of earrings. If you are unhappy with an item, simply send us an email at [email protected] within three days of delivery. Tell us which items you’d like in exchange so we can issue you with a Return Authorisation number. Simply write the RAN on your proof of purchase, enclose it with the item to be returned and post back item/s back to us within 7 days of receiving our RAN. Please note that we cannot offer an exchange on returns after three days of delivery, without a RAN, without proof of purchase and/or if goods are in an unsellable condition. We are excited to have you shopping in our store and would love to share the joy by offering you a free gift. When your order totals $80 or more, we invite you to add a gorgeous free bling gift of your choice to your cart. NEED HELP WITH YOUR GIFT SHOPPING? CHECK OUT OUR GIFT SERVICE ITEMS. Copyright © 2019 - Oz Bling Fashion Jewellery.